Murrells Inlet was the winter retreat for Horry County rice planter Jacob Motte Alston. Alston built this weatherboarded cottage around 1850 “in order to render matters pleasanter.” Motte’s plantation, Woodbourne Plantation in nearby Winyah, was a mere two miles away. Though he built a 12-room home on the plantation property in 1849, he enjoyed staying at his cottage where he could easily travel to the fields on horseback. With the labor of slaves – 87 recorded in 1850 – Alston became a prominent rice grower after receiving Woodbourne from his parents in 1841. Alston penned his life experiences for his grandson in a book that covered topics such as owning slaves, growing rice, and recreation. The book was published as a memoir by the University of South Carolina Press and titled Rice Planter and Sportsman. The Murrells Inlet Historic District contains a significant concentration of buildings which visually reflect the transition of the area from adjoining estates of two nineteenth-century rice planters into a twentieth century resort community. 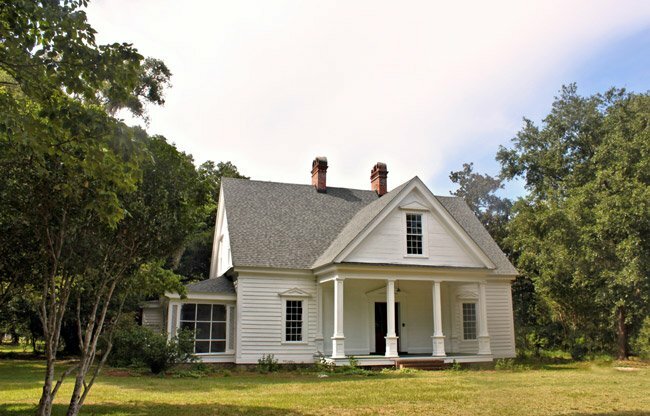 In the mid-nineteenth century, homes were built for two prominent Georgetown County rice planters, Jacob Motte Alston and Dr. Allard Belin Flagg. After the lands began to be subdivided in the early twentieth century, a small community of summer houses developed. Today the historic district contains two antebellum houses, which are local interpretations of the Greek Revival style, as well as a collection of early twentieth century vernacular resort buildings. Residential in character, the historic district contains approximately nineteen houses. Although they exhibit some diversity, the prevalent use of wood as a building material, the large screened porches, and the setting of moss draped trees, marshland, and piers provide a visual unity. Since most of the buildings overlook the creek and marshland to the east, and since the creek and marshland provide the essential setting, a substantial amount of this area has been included in the potential historic district.